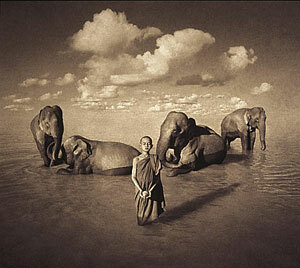 Gregory Colbert's exquisite photography (and movies) explores the interaction between man and animal. His film of the same name aims to "lift the natural barriers between humans and other species" but I thought the photographs furthered that notion better than the film. Where the film at times seems contrived the photography, exhibited in sepia and umber tones and produced on handmade Japanese paper, grabs you, holds you, mesmerizes you. It doesn't let go. You wonder how in the world Colbert "got" the animals and humans to interact as they did, i.e., humans lying in the lap of elephants, cheetahs, orangutans. Roman has been a first rate Los Angeles photographer for years. He first honed his skills at Vogue in his home country of England before moving on to work with master photographers such as Helmut Newton, David Bailey, and Richard Avedon. Anyone that recognizes the intersection of light, subject and geometry as art is, to me, an artist. To do it with a camera makes that person a photographer. Anthony Pierpont is not a profesional photographer but, at times, he sure acts like one. 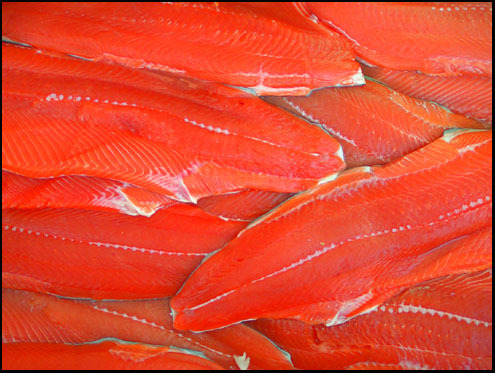 In this Sockeye Salmon photo, he recognizes the shock value of capturing the color and essence of just the salmon. To include anything from the periphery would have diminished the value, he says.